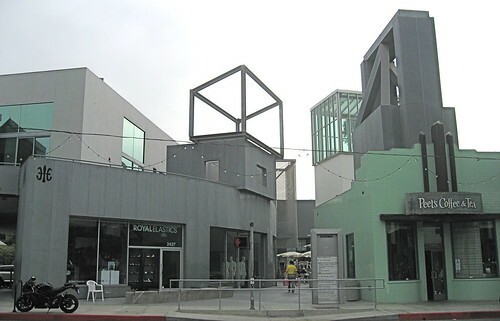 This is the second time I experienced this early Frank Gehry development in Santa Monica and I was struck by how institutional and cold it looked and felt. For a neighborhood known for its friendly and relaxed architecture, Gehry really made an effort to create an impersonal-seeming shopping/cultural complex. The most bizarre detail was the chain-like fence that wrapped around one tower like an external skin. It looks like the concept would have of been clever on paper but in person it seems to lack any warmth or sensitivity towards its environment. The fountain in the courtyard is very corporate. The only stunning aspects of the architectural composition are the two boxes that crown two of the buildings–one glass and the other very reminiscent of Venturi Scott Brown & Assoc.’s House of Benjamin Franklin (1976) with its simple linear frame. The complex was groundbreaking in that it retained some of the site’s memory as a dairy factory but I always found that point of interest as rather academic and not really informing the real world experience by viewers. Check out my photos here. Here‘s a YouTube video by some kid who provides some interesting (if academic facts) about the development.